The Texas chapter of one of the nation's most powerful unions filed for bankruptcy after losing a multi-million dollar lawsuit for its smear campaign against a Houston janitorial company. A jury ordered Service Employees International Union Texas, also known as SEIU District Five, to pay Professional Janitorial Service of Houston $7.8 million in September for making false claims about the company during a campaign to rally support from workers and local activists. A Texas judge rejected the union's request for a mistrial on November 15 and ordered it to hand over files associated with the case to the company for discovery. The union said that filing for Chapter 11 bankruptcy protection reflects the best interests of its members given the costly judgement. "This filing ensures that our union will remain open for business, representing members at the bargaining table and maintaining the vital role the union plays in helping working Houstonians have a voice at work, protecting them from unfair employers, and building a better future for their families," SEIU Texas President Elsa Caballero said in a statement. "Bankruptcy is a common process provided under the law to protect organizations—such as corporations, non-profits, unions etc.—and allows us to seek temporary relief from our debt while we continue to pursue our appeal of an unfair judgment." Brent Southwell, the CEO of the janitorial company, said it plans to continue seeking information from the union to ensure that it is not hiding money to dodge the jury award. He said the company could pursue action against the union's national office, which has more than 1.5 million members, if the Texas branch is not able to pay the judgment. 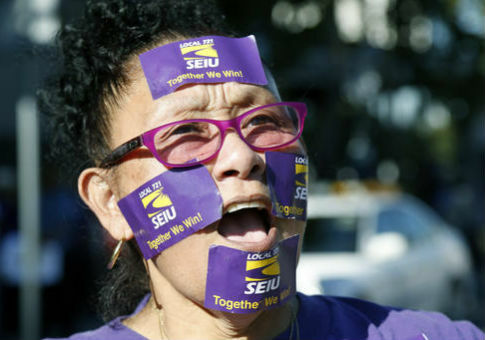 "The SEIU won't escape its fate after attacking my company," Southwell said in a press release. "We will keep this process going for as long as the SEIU wants, first by making them reveal their secrets and then by making the union's Washington, D.C., office pay for its sins." The union's national office did not return a request for comment about the lawsuit or the resulting bankruptcy. SEIU Texas was formed by workers from the Chicago-based SEIU Local 1, which sent organizers to the state to rally employees in the janitorial and service sectors to join the union. Those organizers waged a three-year organizing campaign to pressure PJS into accepting card check unionization rather than a secret ballot election organized by the National Labor Relations Board, the top federal labor arbiter. The union filed 19 unfair labor practice complaints to the NLRB over the course of its campaign, a popular delaying and pressure tactic utilized by union organizers. All of those complaints were dismissed or withdrawn. The janitorial company filed its initial suit in 2007 and was awarded over $5.3 million in damages by a jury. On September 26, a district judge ordered the union to hand over an additional $2.5 million for interest accrued during the lengthy legal proceedings. The company said in a release that a bankruptcy declaration does not allow the union to duck the jury's decision about the cost of its actions. "The jury determined SEIU owes PJS a lot of money, and there is no way they can pretend to be broke based on what we now know," PJS President Floyd Mahanay said in a statement. "The only question is how long they want to drag this out while we make sure every business in Texas joins our cause." The union said it is confident the court's decision will be reversed on appeal. "The judgment must be overturned because, among other things, it violates the free speech rights of workers and their advocates throughout Texas. We are confident that the Court of Appeal will reverse this anti-worker court ruling," Caballero said.